"The foods in this easy recipe are powerhouses of nutrition. Why the recipe is good for you: High antioxidants and fiber in nuts. Nuts lower cholesterol and help prevent heart disease. Adding cinnamon to foods helps suppress blood sugar by boosting insulin activity and cells' ability to process glucose." Beat egg white and water until frothy. Stir nuts into mixture to coat, then drain slightly in a colander, 3-4 minutes. Mix sugar and spices in a plastic bag. Add nuts and shake to coat. Spread wet nut mixture in a single layer on a microwave-safe plate; microwave on high for 1 1/2 minutes, or until mixture is bubbly. Stir. Microwave another 1 1/2 minutes. Remove; stir to separate. Cool. Store in a sealed container. See how to make homemade gourmet spiced party nuts. These were really good and easy to make. I used Splenda in place of the sugar and it turned out fine. Very good especially for people who are following diets such as the South Beach. Thanks! 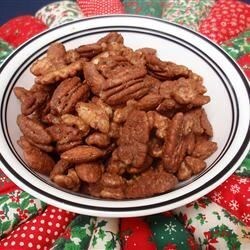 The Spicy Mixed Nuts were easy to make and everyone who tried them over the holidays enjoyed them. Incredible flavour! Easy to make, I am giving as gifts again this year... They are a hit. Very tasty and easy! Just be sure to let them cool in one layer or else they will get all sticky and clumpy. Great recipe! It is more sweet than spicy but delicious!! !